Thanksgiving is a wonderful holiday and a great time to enjoy the gathering of friends and family. If you are hosting Thanksgiving in your home and you have furry family members this can be an exciting and stressful day for them. There are many new people in their territory and a host of yummy smells that can have your cute little buddies hyped up as well as anxious. 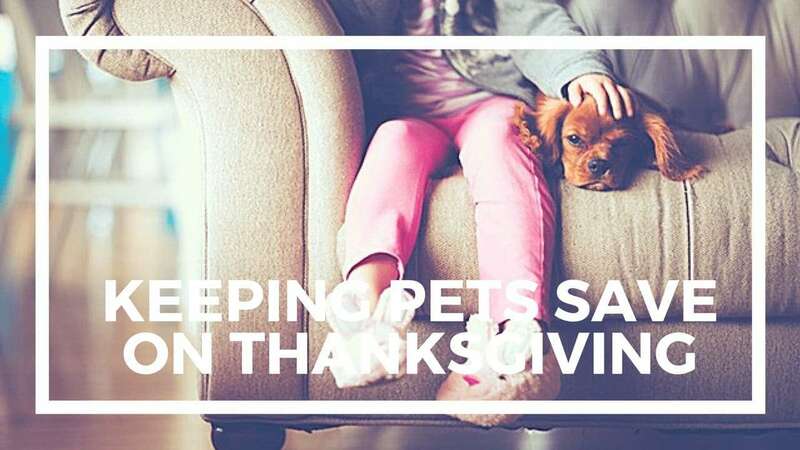 There are many things that pets can get a hold of during the feast that are not safe for them to consume and can cause vomiting, diarrhea or worse and these things can leave a fierce stain behind in your carpet or worse, end up with your furry friend in the hospital. Turkey: A small amount of turkey is fine for your pets, but if you keep giving fido pieces of bird throughout the day it can lead to vomiting and diarrhea and needing to nurse a sick pet. One tablespoon of white turkey meat is an okay amount to serve to pets, but refrain from giving them a larger amount, any skin at all or drippings and gravy. Bones also can be very dangerous for pets they can become lodged and cause severe problems when pets swallow them. Turkey bones are brittle and splinter easy and can lead to punctures in the digestive tract. Make sure to keep the turkey carcass far from a pets reach. These same warnings go for other types of bird meat as well including duck, goose, and chicken. Stuffing: Most Thanksgiving stuffings have onions and garlic in them. These items are not harmful in small quantities, but in larger doses they can make a pet quite ill. If you have an anemic pet garlic and onion can be especially detrimental. More inventive stuffing can contain raisins, currants, or grapes. These three items may seem healthy for pets because they are natural healthy human foods, but they can be toxic even in the smallest amount to a dog’s kidneys. These items could affect cats as well. Potatoes and Yams: Two holiday meal staples. These two items usually contain high amounts of butter and other fats and even dairy. A large portion of potatoes may lead to a tired and bloaty tummy in a human, but for a pet it can mean pancreatitis in a pet especially small breeds of dogs. Corn on the Cob: Corn itself is not harmful to pets it is the cob that is the problem. If you give a cob to your dog expecting them to enjoy it like a bone they could break off chunks of it and swallow them leading to blocked intestines causing quite a mess when they are unable to digest other food properly for a few days until you end up at the vet and in surgery. Bread/Rolls with Yeast: Nice freshly baked bread products are not harmful to your pets, but bread dough that is in the middle of rising is. Yeast likes a nice warm environment to grow and expand so when in an animal’s stomach it can do a large amount of damage. As yeast grows it lets off carbon dioxide and alcohol these items can get into the bloodstream and make Fifi very sick or even lead to death. If your pet has ingested unbaked yeast dough get them to an emergency vet right away. With a large number of people entering into your pet’s space they can easily become overwhelmed and/or anxious. This anxiousness can lead to misbehavior or even urinating on the carpet. Some things you can do to help your pets get used to company is invite guests over on a few trial runs for the big day to get your pets used to strangers in their space. Make sure to continue to socialize your pets so they are not so uncomfortable around guests in the home. Should an unfortunate event occur and you end up with pet accidents on your floor do not fear. Simply consult our home remedies page. For stains that just will not come out feel free to call in the team at All Kleen. We have trained carpet techs ready to battle the toughest of stains. All Kleen wishes you and your pets a wonderful and safe Thanksgiving.